What this guy is doing is amazing. Everything is traditional mid 14th century. ALL his clothing, provisions and food. All of Steven Payne’s clothes are made in the same way they would have been in 1365. This is going to be a hard journey but an amazing experience for him. His aim is to be the first in 500 years to walk the Pilgrims way from Southampton, to the shrine of Becket at Canterbury. He has a letter from the Pope in case anyone objects to him sleeping in their churchyard or porch way. He has done everything from scratch, crafting what he can himself and sourcing what he can’t make and having it done as close to authentic as possible. We know he is taking a jar of honey, a box of block salt, an apple shaped box (which he made himself) full of apple and cinnamon leaf ‘tea’. A walnut box of aromatic herbs for bathing, some bags of coin to donate to people in need, a needle case and a case for thread in case the kit needs repair and a round walnut box of beeswax. He even made his own bowls! A larger one made of chestnut which should serve for main meals and a smaller one is just right for using as a maser (drinking bowl). 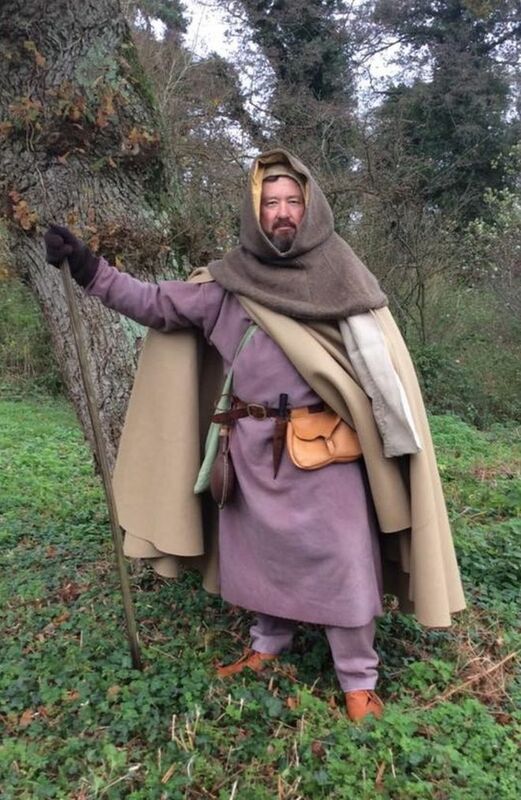 He received a lot of information on medieval food ‘on the go’ and is planning on taking items such as a heavy fruit loaf almonds, cheese, dried fruit, bread, boiled eggs, salt, cinnamon, dried apple slices, oat cakes and a pork and venison pie. He is also taking some Rochester dark ginger wine which is non-alcoholic. He is taking a wash kit that will help with hygiene, he really did his research and found so much good and interesting articles and information. His wash kit includes home made olive oil soap, salt for the teeth, a block of deodorising alum, cloves, a boxwood comb and some liquorice root sticks, all on a woollen ‘towel’. He also made his own Staff. The staff is of a particular design, shown in numerous carvings and paintings…….roughly 5′ 6″ to 6′ 6″ tall it had a double ball carved into the shaft. This meant that when carried over the shoulder, a bag of possessions could be tied to the end where the balls would prevent it from slipping off, but equally importantly the double ball acted like a pommel and cross guard, allowing the staff to be used much like a double-handed waster (practice sword) if the Pilgrim should come under attack by robbers or wolves along the way. On his travels he will be taking a copy of a 14th century Paternoster that he made for a friend in the USA, he will have it blessed by the Archbishop of Canterbury, as the practice of carrying an object on behalf of someone who could not make the journey themselves was common in the middle ages, and was endorsed by the Church.